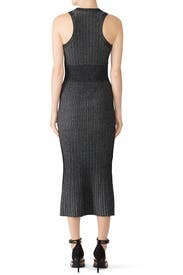 Figure flattering Jason Wu Grey dress featuring a thick waistband shows off all the right curves. Sized: XS-XL, one length available. Regular measures 47" from shoulder to hemline. 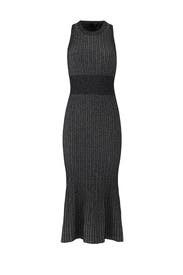 Black and gunmetal knit (50% Viscose, 30% Nylon, 20% Merino wool). Sheath. Sleeveless. Crew neckline. 47" from center front to hemline. Imported. This dress is stunning... but reads far dressier than I anticipated. There are lurex threads in the fabric and is quite shiny. Would be great for a holiday party, but I was renting this for work. Sent back w/o wearing but would def rent again for a semi fancy event! Definitely more sparkly in person but I still found it appropriate for a work dinner at a nice restaurant. Stretchy knit material. You will need a racer back bra with this dress. I'm 5'2. Fell just above my ankles. As most - sparklier than shown. Ended up being a little fancier because of that but still pulled off with blazer to work. Super fun super comfy. want to purchase ! I am usually a Medium 4-6, renter this in a Small and am still not sure it feels like it fits. It is suuuuper comfortable though. Not entirely sure it's flattering but I like it. It's sparkly and still subtle, feels like it'll be great for an evening party. 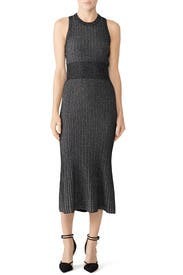 This is a perfect dress for an occasion that requires comfort and style. I wore this to a family lunch and movie. It was festive and fun but very comfortable. 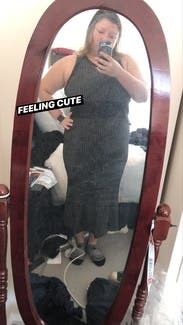 I wore it with heels and thought it was flattering as well. This dress looks much better in person. I wore an XS without a bra. Got lots of compliments. I did have little fat pockets on my underarms show, but that might be me overthinking. Great day to night look! I paired this with a blazer and wore to work followed by date night. Love the metallic that gives it some sparkle and love the slight flare in the skirt! This seemed a little big to be a medium and had way more sparkle than I was prepared for. I love the silhouette of the dress though. 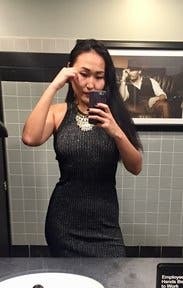 I love sparkles, and this dress has sparkle! The fit was form-fitting so be aware if you don't want all your curves to show. As other reviewers mentioned, the dress is much more sparkly than the picture shows. This was a good thing for me, and one of the reasons I rented this dress in the first place. New Year's Eve or Knights Jousting? That's what this beautifully fitted dress springs to mind.. Metallic shimmer all the way through! Wish it were more subdude. great glitter details! super stretchy and comfortable. Rented this for a holiday party. 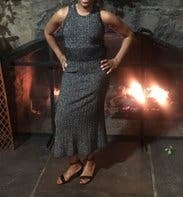 It sparkled, was a nice long length that felt elegant and was nice sturdy sweater fabric. The one downside to this dress is that it showed my tummy a little more than I would like. After wearing the drrss for 2 hours or so it wasn't so tight on my tummy which was good. But still I would say medium flattering. All in all, fun dress. 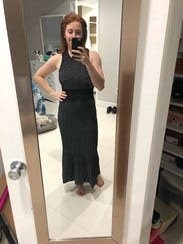 Stretchy, easy to wear dress. It's very shiny, not really suitable for daytime, but perfect for a party. A cocktail bridal shower given by my best friends. Dancing and partying abound! I wore this dress to my daughter's bridal shower given by my best friends. The dress was a hit and I got so many complements. It was very comfortable and we all ended up dancing so that was a good thing. I wore it with 3 inch heeled black leather tall boots. I felt great! From the pics it looked like it could work during the day but it cannot -This is very sparkly silver with black undertone (not the other way around). Pretty for a fancy dinner or upscale party. Not for daytime. 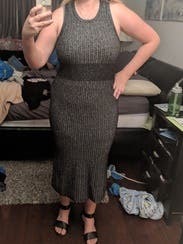 This dress fit perfectly in all the right places. It was a great way to celebrate my weight loss. The space under the armpit was a little big. Make sure you wear a black bra so that it blends in with the dress. I wore a sports bra just to feel more secure and for the biker back. This designer understands the shape of women, you’re gonna love it just as much as I did. The problem for me with this dress is that it was intended for a party or holiday event. I rented it to wear during a presentation at work, but didn't look closely enough at the actual fabric by zooming in on it. I love the dress; it's a great fit and cut, but just wasn't appropriate for the event.